Trials of Labour, by Brian Burtch, is a detailed study of the available social science literature on childbirth and midwifery. 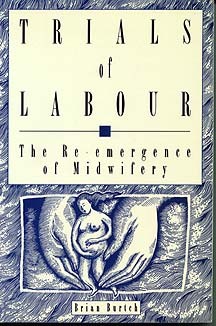 The transformation of the role of the midwife is examined, especially the resurgence of the midwifery movement in North America. Burtch uses historical and contemporary materials to review ways in which midwives were subject to legal regulations in various countries. In Canada, midwifery practice was essentially outlawed, in favour of childbirth attendance by physicans and nurses. Original research on over 1,000 attempted home births in Canada is presented, using studies from other countries. Dilemmas of legalizing midwives are outlined, along with concerns over medicalizing and regulating birth. Canada is the only industrialized country to not recognize midwifery as an established occupation. This book traces the displacement of midwives in Canada, and their resurgence, in the context of international material on midwifery, birth, and obstetrical control. "Burtch presents a dynamic view of the midwifery movement, looking at it within the constraints of the larger political system and the law ... One of its greatest strengths lies in the original research on community midwives." Dr. Shelly Romalis, Anthropology, York University. [McGill-Queen's University Press], 1994, 288 pages. FAX: (514) 398-4333 for specific information on postage, taxes (where applicable), etc. Outside Canada, prices are in U.S. dollars.